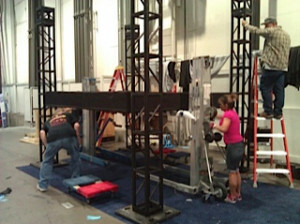 NewscastStudio is following Devlin Design Group and Brightline this year at NAB, exploring their convention experience. Stay tuned for daily updates from the two companies during the show. It’s the biggest toy show in the broadcast biz and the creative geniuses at both Devlin Design Group and Brightline are making sure their presentation area will do more than just catch the eyes of tens of thousands of NAB visitors this week in Las Vegas. 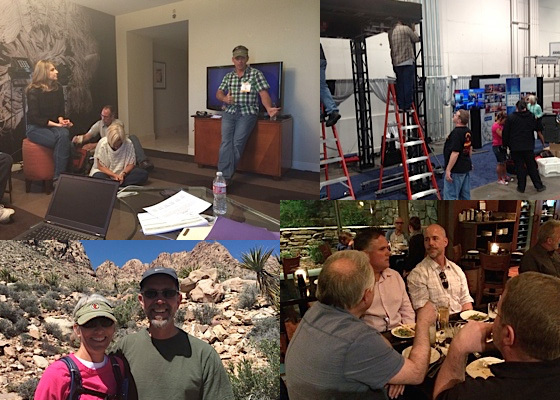 The teams from Brightline and DDG are excited about the story they are sharing with broadcasters about dazzling scenic designs and spot-on controlled lighting environments. The work was pretty intense at the convention center throughout the weekend to make sure everything was perfect before the show opened today. It started with a bare concrete floor, and then became very interesting as each succeeding crate was opened. The next step was erecting a huge lighting grid to showcase the groundbreaking Brightline fixtures. What is really cool about these studio lighting systems is the near perfect color rendering they provide, and the fact that they are actually cool…throwing off nearly non-existent heat, while significantly lowering studio energy costs. But the NAB preparations weren’t all work and no play. The nearly 30-year-old collaboration and integration between these two forward looking companies has grown beyond a business arrangement and is now relation based. They complete each other’s thoughts with each succeeding project. These guys share a lot of the same values when it comes to creative presentation solutions…and when it comes to fun. The first break in the weekend NAB preps came Saturday night with a trip to Cirque de Soleil. 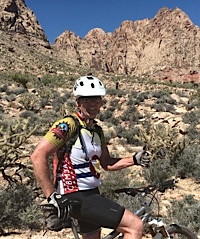 First thing Sunday morning…mountain biking and a hike in the Red Rock area just outside of Las Vegas. Then back to the Las Vegas Convention Center to sweat the details, make last minute adjustments and make sure everything is perfect. You may think these guys could be the poster children for the concept of working hard and playing hard. It’s not that at all. It’s more about achieving balance between creative frenzy and creative rejuvenation. Late Sunday night…with the NAB opening just hours away, it was time to break bread together while still brainstorming on how to make the show even better and how to tell their story. And they’re making it easy to share that story. The Devlin Design Group/Brightline Suite at The Renaissance Hotel, is offering free coffee to NAB attendees between 8am and 9:30am. They’re in Suite 830 at The Renaissance, which is right next to the convention center. On the convention floor, you can find Brightline and Devlin Design Group in booth C3951. Drop by and you’ll have a chance to win one of two iPad Mini’s! The party doesn’t end there. Their Suite at The Renaissance will be open for Happy Hour on Monday and Tuesday from 5pm-6:30pm.